This tool generates preview of EDB file after scanning it. All mailboxes are loaded with items like Email, Calendars, Contacts, Tasks, Notes, etc. It maintains & previews your email signature with associated data of both folder (Private & Public). You can view sender name, receiver name, sending time, receiving time, email size, etc. You can scan EDB file using two different modes: Quick Scan mode will help you to index EDB data and advanced scan mode will help you perform deep analysis of data to index it. You can view your emails, calendars and other items in the same structure as you used to see it in email client. The entire software is built on a single UI to make the experience convenient. You don't need to pay any amount of money for using this software. Whenever you need EDB reader tool, you can just download, install and use it. EDB file is known as Extensible Storage Engine Database file, which is developed my Microsoft to store entire mailbox items of Exchange server, & it is only usable on a Windows platform. 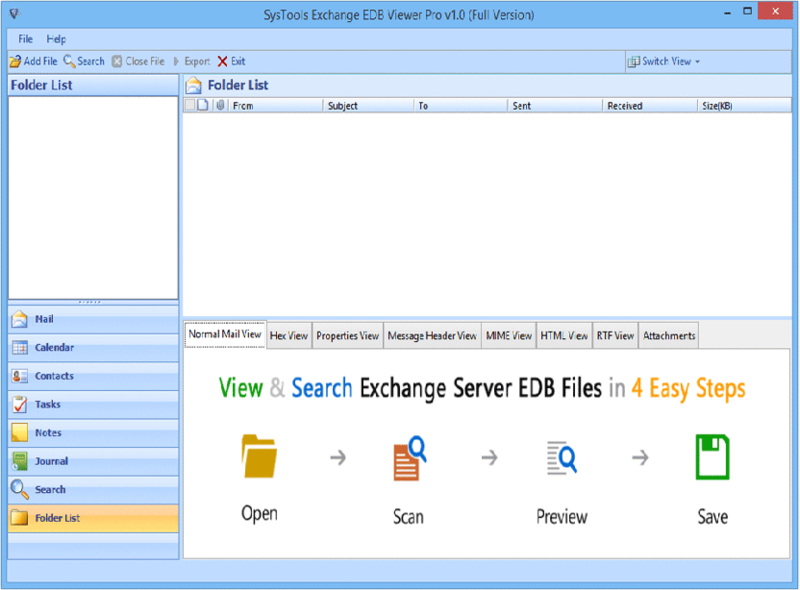 EDB file stores RTF (Rich Text Format) data of Exchange Server. Exchange Server creates two different types of files to store user data: private.edb & public.edb. Private EDB file stores all text data with attachments while Public stores shared files & folders. I use EDB file reader once in every month to open EDB file archives when Exchange Server goes down. At these kinds of critical circumstances, it helps me to access my mails. Can I save mailbox data using EDB File Reader? No, you cannot export your mailbox data using this tool. An export based utility needs to be implemented to use for that purpose. Can this software view my private.edb as well as public.edb data? Yes, this tool can open EDB file to show both the folder contents. Does this tool apply any limitation on the size of EDB file to be viewed? No, this software is capable of opening unlimited size of EDB file. Do I need to install any email client or a supporting tool to use the tool? No, this software is a standalone and doesn't require external support. You can view your EDB file items without installation of an email client or any other tool. Can I install EDB file reader in Mac to view my emails? No, you cannot. This software can be installed only in Windows Operating System. It helped me at one of the most important times when I was in a meeting with clients and suddenly Exchange Server stopped responding then I searched for a tool that could help me open EDB file to read mails & I got this tool. It helped me to view my emails just within five minutes. EDB Reader tool is great. I use it generally to open & view some emails from archives of Exchange Server database file. The best thing of this tool how quick it is at opening the EDB files.